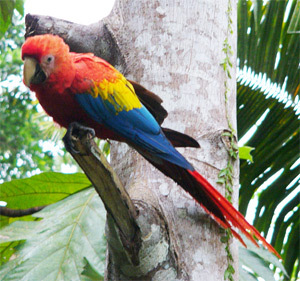 We had to take a boat trip from Amazonia Lodge down to Manu Wildlife Centre. It was to be a long journey, in the end taking almost eight and a half hours. The weather was hot and sunny and we birded all the way. 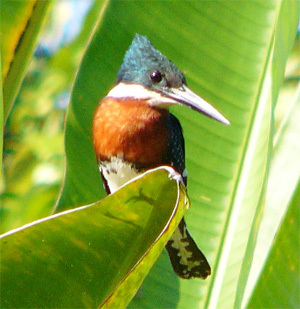 The splendid Amazon Kingfisher put into the shade the somewhat duller Drab Water-tyrant. 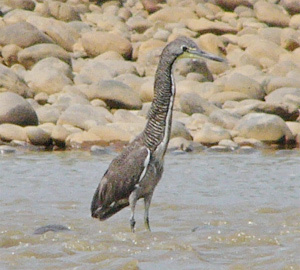 Fasciated Tiger-herons were seen occasionally and Black Caracaras favoured feeding on the shoreline, as did Great Black Hawks. The expected egrets were present: Snowy, Great and Striated, but we were more interested in their cousins: Cocoi Heron and Capped Heron (a very strange looking heron!). Waders were few but we found the two we wanted: Collared Plover and Pied Lapwing. White-banded Swallows are very classy birds and we saw plenty of them, along with the much more common White-winged Swallows. Giant Cowbirds fed along the shore and both Amazon and Large-billed Terns showed well, the latter is a superb bird, one of my top birds of the trip. Both Gray and Crane Hawks were seen by the river shore but were not as obvious as two huge Horned Screamers walking slowly along a sandy bar. Flocks of Short-tailed Swifts were seen to live up to their name. We encountered two flocks, of about 25 and 35 birds respectively, of Sand-colored Nighthawks, either roosting on dead trees lying in the river or flying along the river. Muscovy Ducks were eventually found and we saw Swallow-wings sitting high in the riverside trees. A stork proved some excitement but it was 'just' a Wood Stork and as we got nearer to Manu we began seeing our first Scarlet Macaws. We briefly stopped at the village of Boca Manu to change engines as our first one was suffering problems. Fortunately the boatmen carried a spare and had it changed in about half an hour, whilst we drank cool drinks in a shop in the village. As we got out of the boat at Manu Wildlife Centre we came across two men carrying a catfish they had just caught. It was about four feet long and very heavy. We ate it later that week! The final new bird of the day was in the gardens of Manu Wildlife Centre, Cinammon-throated Woodcreeper. In the morning of our first full day in MWC we all received a surprise. A weather system known as a 'Friaje' (pronounced free ah ha) had settled over the Amazon overnight and brought with it cold air. None of us expected to be birding in the Amazon rainforest whilst wearing multiple layers of clothing, and in some cases, gloves and woolly hats! The cool was pleasant enough but it had a negative affect on the birds and we had three days of lower-than-usual species numbers. Not to be deterred by cold weather, well, about 15°C during the day, we headed into the rainforest. First we found Red-necked Woodpecker and could hear White-throated Toucans. Our first antbird was White-flanked Antwren followed by Plain-throated Antwren. Red-crowned Ant-tanagers are birds of understory forest and we found a pair of them soon followed by our first White-faced Nunbird. Whenever a woodcreeper was seen it was tracked and identified. We had two in quick succession: Buff-throated and Elegant. A Needle-billed Hermit was found sitting quietly in the forest and a Black-spotted Bare-eye made a very brief appearance. Then back to antbirds with Gray Antwren being found. High above us Black Spider Monkeys moved through the trees and Mealy Parrots screeched overhead. Time for another antbird: Black-faced Antbird this time. Still looking high in the trees we found a Band-tailed Manakin lek and watched these lovely little birds doing their dance along the thin upper branches. A small woodcreeper was found that turned out to be Wedge-billed and, after some superb spotting by Frank, we added the diminutive Dwarf Tyrant-manakin to the list. We might have seen Chestnut-eared Aracaris before but not a group of four causing mayhem as they raided the nests of Yellow-rumped Caciques. Looking over the river from the lodge we spotted some grey-winged birds that were Bare-necked Fruitcrows and found another Blue-throated Piping-guan. In the lodge gardens we saw another Rufous-breasted Hermit and added Reddish Hermit to our already huge list. Time for lunch. Lunch was interrupted by two things. 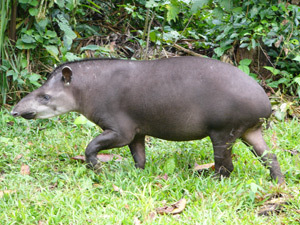 One was the semi-tame female Brazilian Tapir that sometimes walked around the lodges. She was a big beast! The second was a White-vented Euphonia. In the afternoon we had many of the antbirds we had seen in the morning plus two Rufous-tailed Flatbills (an uncommon species), Brown-mandibled Aracari, Black-bellied Cuckoo, a very nice Great Jacamar, Purple-throated Fruitcrows, Long-tailed Woodcreeper, Black-crowned Tityra and White-faced Cappuchin monkeys. On the morning of our second day at MWC we set off in the boat down the river to a clay lick named Tambo Blanquillo. We had to get there early to be in the hide before the parrots and macaws came in. A breakfast of pancakes and syrup was served as we looked through the already-large parrot flocks. There were hundreds if not thousands of birds present, mainly Blue-headed Parrots, but we soon found Mealy Parrots, Red-and-green Macaws, Blue-and-yellow Macaws, and one of our target species here, Orange-cheeked Parrot. Amongst the Mealys we also found a few Yellow-crowned Amazons. Unfortunately despite gathering in huge numbers the birds did not come to the lick because as they were about to desend an adult and juvenile Great Black Hawk appeared and proceeded to walk through the grass or sit on trees calling loudly. Surrounding the hides is low vegetation including grasses and damp-loving plants, although the river no longer flows beneath the hide. Birds seemed to like this habitat and we had a singing Yellow-browed Sparrow, Chestnut-bellied and Double-collared Seedeaters, Blue-black Grassquit and Little Ground-tyrant. A yellow bird kept briefly appearing and disappearing but eventually showed well as a Subtropical Doradito. As we walked back to the boat we had more seedeaters and a small raptor sitting on top of a thin tree was our first Bat Falcon. We headed back along the river to an area of forest that had a much greater than usual density of bamboo. This habitat has certain species not found in the rest of the forest, species referred to as bamboo specialists. The trail is known as the 'antthrush trail'. Of course, there are antbirds here and we soon located a singing male Dot-winged Antwren right above the path. This was followed a little later by a White-lined Antbird. Birds here were not seen in flocks but usually singley or in pairs. We next found a bamboo specialist in the form of Bamboo (Dusky-cheeked) Foliage-gleaner and then a Dark-billed Cuckoo sititng quietly in a tree not far above our heads. Another bamboo specialist was added to the list with the discovery of a Large-headed Flatbill and we heard, but sadly did not manage to see, Manu Antbird. The rare Dusky-tailed Flatbill was next to fall to our searching and as we searched for this bird a lone Rufous-capped Nunlet was located. Another foliage-gleaner was soon added to our list: Chestnut-crowned Foliage-gleaner and we found a pair of Dusky-headed Parakeets. Perhaps the most surprising bird was found when a large bird was seen flying into a tree, again almost just above our heads. We could see it was a raptor and soon realised we had a Gray-breasted Goshawk, a good find and with a better view than the experienced Frank had ever seen before. Then it was back to MWC for lunch and a spot of garden birding. I managed to catch up with the previously-elusive Plain-capped Spinetail and we found Ochre-bellied Flycatcher, some very close Scarlet Macaws, close enough for one to bite a hole in Vaughan's wellie, so they were used to humans! A large spotted bird was a Thrush-like Wren and a sudden flash of bright orange-red turned out to be a Band-tailed Manakin. In the afternoon we walked the Collpa Trail in the rain. Despite the sounds of heavy rain not much water made it through the canopy of leaves. We again found a sitting Needle-billed Hermit and our first Grayish Mourner. New for the trip were Golden-olive Woodpecker, Scaly-breasted Woodpecker, White-winged Shrike-tanager and Pink-throated Becard. The morning of day three at MWC arrived and we headed to an oxbow lake. The short walk from the river to the lake brought us in contact with a vigorous flock of birds and as well as the aleardy-seen Paradise and Masked Crimson Tanagers we had Turquoise and Green-and-gold Tanagers. Another burst of colour was seen when a Gilded Barbet came through with the flock and we managed to track down a White-eyed Attila. A grey bird turned out to be a Syristes and some saw a Wing-barred Piprites. The flock also contained a Blue-crowned Motmot, Hauxwell's Thrush, Black-tailed Tityra and Yellow-bellied Dacnis. A little further on we added Lettered Aracari and Ruddy Pigeon. The boat that was to take us on Cocha Blano, the oxbow lake, was a flat rectangle with low chairs arranged in rows of three. As the boat was being prepared we scanned the lake noting Wattled Jacanas, Hoatzins and a Black-collared Hawk. A Rufous-and-green Kingfisher was seen flying across the water and, in the distance, we could see a family of Giant Otters. Our regular river boatmen we also the crew for the oxbow raft and they punted us gently and almost silently over the shallow water. 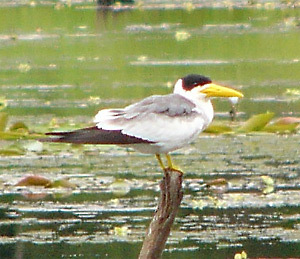 Both Amazonian and Large-billed Terns were present as were Least Grebes and Muscovy Ducks. Wattled Jacanas were common, walking on the lily pads sometimes right next to the raft. Two Sungrebes were a highlight for all as were close views of the Giant Otters. The otters followed the raft almost the entire journey, occasionally raising their heads and necks out of the water and barking at us. 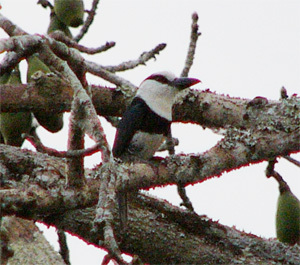 Lesser Kiskadees were seen closely and we glided past Black Caiman and Limpkins. A small bird feeding on thin overhanging branches was an Amazonian Streaked Antwren and our first Pale-vented Pigeons sat in trees and flew over the water. Three Greater Anis were found and we were lucky enough to come across a pair of Green Ibis. A Bat Falcon flew past and a Gray-breasted Woodrail fed in an open patch by the lakeshore. The eerie sound of Horned Screamers echoed across the lake and silent Rufescent Tiger-herons sat in low trees eyeing the water. The final new bird for the trip was a Bran-colored Flycatcher. From the river boat heading back to MWC we saw a lounging White Caiman and, most exciting, three Orinoco Geese, a species we hoped to see but which are getting hard to find. Back at MWC we walked in the forest in The Grid. 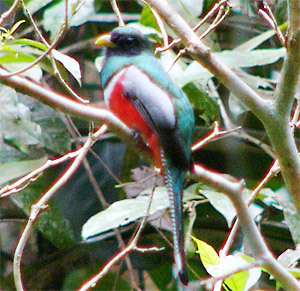 A couple of Collared Trogons were found as were a couple of Gilded Barbets. Screaming Pihas were calling all over the place and we tracked down one seeing a quite-dull grey bird making a very loud noise. We came across our first Casqued Oropendola quickly followed by a Red-stained Woodpecker. A female White-throated Antbird was next to be found, then Spot-winged Antshrike, Lemon-throated Barbet and finally Dusky-capped Greenlet. After lunch it was time to ascend the 30m canopy tower, climbing up a spiral metal staircase that wobbled nicely. At the top are two wooden platforms, one about a metre and a half above the other. It is best to keep a balanced number of people on each as it is a long way down! Getting into the canopy is essential to find some rainforest species that never go below the canopy and to see anything flying overhead. 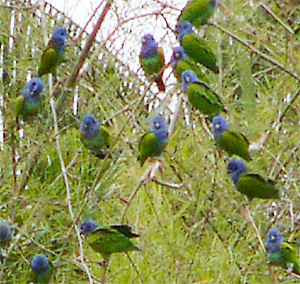 Our tree was fruiting and was particularly popular with Cobalt-winged Parakeets, amongst whom we found Tui Parakeet. A 'scoped distant bird was identifed as a White-browed Purpletuft and the sky held Fork-tailed Palm-swifts, Greater Yellow-headed Vulture and an impressive adult King Vulture (we later had a juvenile fly over as well). Scanning the trees we found Great Jacamar, White-lored and Rufous-bellied Euphonias. A flowering tree was a feeding site for hummers: White-chinned Sapphire and White-necked Jacobin (a very classy bird) were new to the list. A Bare-necked Fruitcrow was nesting nearby as one or two kept appearing with nest material in their beaks. Another Bat Falcon was seen and we found a Chestnut-winged Foliage-gleaner. Things got particularly exciting when someone found a Cream-colored Woodpecker, one of those birds everyone wants to see. It showed extremely well and was surprisingly yellow rather than cream coloured. Our tree then hosted a Short-crested Flycatcher but we were distracted when we had both Channel-billed Toucan and White-throated Toucan. Apparently one has a slightly larger bill than the other but even when seen one after the other this is not a reliable fieldmark. However, they call completely differently so we could be sure of our identifications. Another Red-stained Woodpecker was found followed by a Ringed Woodpecker. Someone noticed that a bird had quietly appeared in our tree and we all admired a White-necked Puffbird, then another and another! Three in one tree, our tree, and nice and close. A group of about 50 White-eyed Parrots flew past and then a Red-necked Woodpecker joined our ever-growing woodpecker list. The final bird seen from the canopy tower was a nice Double-toothed Kite. The walk through the forest was made in failing light and we could hear Starred Wood-quail and Amazonian Pygmy-owls calling. Back in the lodge gardens we located a pygmy-owl sitting in a tree and showing well in the torchlight. Day four at MWC was warmer than the last few days and it looked like the friaje had moved on. We headed back to the canopy tower to see what else we could find. 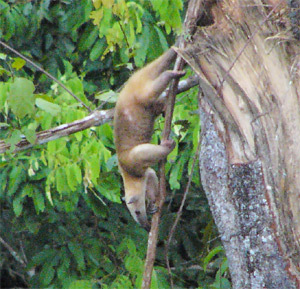 A highlight was a Southern Tamandua, a species of anteater with golden fur. As well as many of yesterday's species we found another puffbird, this time Striolated Puffbird, eventually seeing two or perhaps three individuals plus three Slate-colored Hawks, Brown-mandibled Aracari and Plum-throated Cotinga. A hummingbird was seen to be fly catching in a large open area and we admired this Long-billed Starthroat as it chased flies around the sky, occasionally giving us flashes of iridescence. Two small groups of White-bellied Parrots shot past and we had above-the-bird views of a Band-tailed Manakin. Frank located a Short-tailed Pygmy-tyrant, a tiny bird that is the smallest passerine in the world. Finally, at the base of the tower after the long descent we had excellent views of a pair of Plumbeous Antbirds. We then did a quick visit to The Grid where there are always new birds to be found. As usual we were checking all woodcreepers and as we watched a Wedge-billed we found the much-larger Amazonian Barred Woodcreeper. Then we had good views of a pair of Dusky-throated Antshrikes followed by a sudden stop as a group of Pale-winged Trumpeters walked across the path in front of us. Then it was back to a bit of colour with Amazonian White-tailed Trogon and White-throated Woodpecker. A flock included many species we had seen before plus the uncommon Rufous-tailed Foliage-gleaner. The last new bird of the morning was also with this flock: Yellow-crested Tanager. After lunch we went to another oxbow lake for two special birds. Between the river and the oxbow we had great views of a Black-spotted Bare-eye. The species of this oxbow were very like the last oxbow but no otters this time. We did get yet another Sungrebe. As we moved slowly and silently through the water, under a clear sky and warm sun, we were checking all birds, especially those that looked all black. However a black bird was not our first new bird. As we cruised past a fine Green Kingfisher and a colony of Yellow-rumped Caciques we came across target species number 1: Purus Jacamar, sitting on an open branch over the lake. Then it was time for the return trip and all eyes were looking for black birds. Two new trip species were seen as we searched, one of one bush, one on the next bush along! They were Great Seedfinch and Lesser Seedfinch. As we watched these Frank spotted a small bird in front of them and called White-lored Tyrranulet, another new bird. As we approached the dock we saw a distant black bird. We docked and 'scoped it and sure enough there was target number 2: a male Pale-eyed Blackbird. There was a female close by and then the male flew towards us and then another male appeared and sat just across the lake from us. What a good end to the trip, but it was not the end. Something was calling loudly across the water and we soon located it and saw it was a fine male Spix's Guan. A great end to another bird-filled day. We started day five at MWC back at the Antthrush trail and with a female Goeldi's Antbird. We heard and actually saw well two Cabani's Spinetails and came across a White-backed Fire-eye. Bamboo Foliage-gleaner was again seen followed by another target bamboo specialist, the beautiful Rufous-headed Woodpecker. Just below the woodpecker we spotted a Rufous-breasted Piculet. A little further on and Vaughan found a good bird: Peruvian Recurvebill, a much-wanted species for all. Despite putting in a lot of effort we did not manage to Rufous-fronted Antthrush or Manu Antbird but we did finish the morning with two impressive Red-billed Scythebills and a pair of Great Antshrikes. This afternoon we again did the Collpa Trail. We had a cracking start when, as we crossed the bridge, a Sunbittern flushed and sat on a nearby branch before flying down stream. Some way into the forest and we came across four Broad-billed Motmots high in the trees and then found another mixed flock including yet another new tanager, Yellow-bellied Tanager. As we checked this flock a Golden-green Woodpecker was found plus another Rufous-tailed Flatbill. Finally, as we walked back in the fading light, we stopped and waited, and admired a Rufous-capped Antthrush as it walked slowly across the path, stopped to look at us, then disappeared into the undergrowth. After dinner we were out in the lodge gardens playing the growling call of Great Potoo. We had heard them othe rnights but not managed to see one. Suddenly there it was. A huge Great Potoo on a nice open stump, posing beautifully in the torchlight. Pretty well everyone staying at the lodge came out to have a look and to borrow binoculars to admire this bird. Tomorrow we were due to leave Manu Wildlife Centre and fly back to Cusco. I say due because we had heard that the plane from Boca Manu had been out of action for the last few days and the only way out was a very long boat ride followed by driving the Manu Road non-stop! Twenty-four hours minimum, probably longer. Not something to look forward to. We had to wait to see what would happen. Day six dawned sunny and warm again and we heard that a plane had been chartered from Lima to fly down via Cusco and pick us up. We were all mightily relieved. We had about three hours to enjoy the boat trip up river to Boca Manu seeing the usual species plus Swallow-tanager and an adult and three young Capybaras. The walk from the river to the airfield gave us a Pale-winged Trumpeter, one that had been domesticated by the locals, and which liked to walk around with us hoping for food! 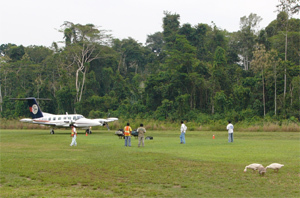 The airfield is a mile-long strip of grass surrounded by forest. The terminal is a raised, open sided hut with a small radio in it and a set of scales large enough to take bags and people. The luggage transport system is two wheelbarrows. We particularly enjoyed the domestic geese on the runway. The runway also held two Upland Sandpiper and six Smooth-billed Anis lurked around the edges in the scrubby bushes. Since the plane took only eight people at a time, and us plus other flyers totalled 40+, we had to do the flight in groups. The first group flew out and left three of us to do a spot of birding. Nothing new was added but we did see Roadside Hawk, Gray Hawk and a King Vulture, and lots of Plumbeous Kites.